First reviewed on 11/16/08, Secret Letters from 0 + 10 left a great impression on me. A wonderful, quiet story, Morgenstern's writing is superlative. Your children will remember this book long into adulthood. Secret Letters from 0 to 10 by Susie Morgenstern is a gem of a book. It turned up on the shelves of the bookstore one day and I was drawn to the cover, its length and the fact that is is set in France. After reading the author information in the back I learned that Morgentstern is an American who was born in New Jersey and has lived in France for more than thirty years. It is interesting to note that she does not translate her own work. 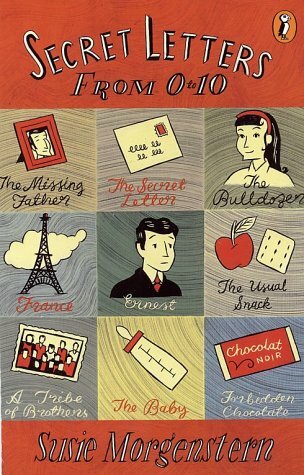 Published in 1996, Secret Letters from 0 to 10 won France's equivalent of the Newbery Award, as well as awards in America. With its large cast of unique characters and a profound, emotional story folded neatly into brief chapters, I am reminded of Polly Horvath's remarkable young adult novels Everything on a Waffle and My One Hundred Adventures. Morgenstern has written over thirty books for children in French, some of which are available in translation and look like they promise to be every bit as wonderful as Secret Letters from 0 to 10, especially The Book of Coupons, also a must read, and the only other book by Morgenstern available in English in the US that is in print. Morgenstern is a miniaturist and can create a complete world filled with many lives in a few pages. When we first meet our protagonist, Ernest Morlaisse, he is a ten year old boy living with his eighty year old grandmother, named, but never called, Precious. His small, circumscribed world also includes Germaine, who, although almost as old as his grandmother, serves as their housekeeper and cook. Grandmother never leaves the house, which is without telephone and television, and Germaine feeds the family a regimented diet of simple foods which include a snack of an apple and a single cracker everyday after school and soup every night for dinner. Ernest, who cannot hide the fact that he is quite handsome, has chances to break out of this routine but is afraid to try something he has never experienced, such as the cookies that his admiring female classmates regularly leave on his desk. Ernest does not realize how quiet and empty his life is until a new student in class, Victoria de Montardent, takes the empty seat next to his. Despite her immediate insertion of herself into Ernest's life, Victoria seems only charming and right in everything she says and does, even when she tells anyone who will listen that she and Ernest are in love and will marry in thirteen years, eight months and two days. Victoria never comes off as precocious or sassy, as some characters in books popular in the States can be. a history lesson on some British queen, but she answered, "Because I was born after they had had twelve boys. My parents wanted a girl so much that they tried thirteen times . . . and finally they had me. My name means 'victory.'" Victoria, who is collecting the aluminum wrapping from chocolate bars and hopes to have 2,000 by the year 2000, is surprised by the many foods Ernest has never tasted. Upon hearing that he has never tried chili con carne, she says, "Don't worry, Ernest, I'll take care of your food education, but it would help if you decided to like chocolate." The doors that Victoria opens for Ernest, who in turn opens for his grandmother, are delightful, funny and touching to read about. And it is through this seemingly innocent, every day occurrence of eating that Victoria does educate Ernest and open up his world outside of his his home with Precious. When Germain takes ill and the new housekeeper arrives, things begin to change inside his home as well, again through the magical, transformative medium of food. I have never been to a restaurant in my life. I have never been out on a Sunday. I have never eaten couscous. My grandmother has never been outside her apartment for as long as I have known her. It is a great day when a "never" is erased. But when three "nevers" are erased in one day and are replaced by three "first times," that day is three times as great. Yesterday, I went out with Grandmother to the restaurant on the corner to eat couscous. And what about those letters from 0 to 10? Too much about them would give away the many surprises in this short but wonderful book. I can tell you that, in the beginning of the book we learn that Precious' father died in World War I and her husband died in World War II before Gaspard, Ernest's father, was born, and she spends much of her time in bed reading letters from the warfront. Sunday afternoons especially are reserved for "reading" an encrypted letter from her father, Adrian, that she keeps locked in a box. However, none of these are the letters of the title. I was almost done with the book before I stopped to wonder what these letters from 0 to 10 are. And, magically, at that point the story answered me with a poignant revelation that made perfect sense. Readers who enjoyed Secret Letters from 0 to 10 might also like Saffy's Angel by British author Hilary McKay and is the first in a series of books set about the colorfully messy Casson family and their children, all of whom (except for Saffron) are named after hues from the color chart. When Saffron discovers she is adopted, she secretly plans to find a way from England to Italy to retrieve the secret legacy her mother left behind. Jeremy Fink and the Meaning of Life by Wendy Mass, while considerably longer than Secret Letters from 0 to 10, is also a story in which a quiet, sheltered boy and an exuberant, lively girl experience life changing situations and encounter the many philosophies and belief systems that people choose in their search for the keys. Looks excellent...ordered it right away! Thanks. I thought this might be a good one for your family! It is different from the Penderwicks, but there are similarities as well. While Jeffrey's mother is not really given the chance to redeem herself in the Penderwicks, Precious has a very nice turn of temperament by the end of the book. I am curious to know if your library has it! Yes, they did have it. It's 10 years old already...I've been meaning to thank you for not focusing solely on books that are so new that only advanced copies are floating around. I'm so glad to hear that! You have an excellent library (better than mine...) It was my goal when I started the blog to review books that are available in paperback only for a few reasons - 1) books are expensive, and if you are reading my blog you probably have at least one avid reader at home who goes through books like water. 2) While I admire, respect and value the work of other kidlit bloggers, I was disappointed by their almost singular focus on new books and 3) There are SO MANY excellent books in this world that are not new, I wanted to make sure parents and kids found them and read them and kept them in print. Ivy gave this one one-and-a-half thumbs up -- very much enjoyed it, but not on the same level as her current holy trinity of Savvy, Penderwicks and Mysterious Benedict Society. Speaking of MBS, I recommended it to a friend last week as a read-aloud. Sam is just turning 7, but is extremely bright and I thought it might be just the thing. Turns out, his dad says they've never had so much fun with a book before -- he was waking up in the morning and asking to continue the story before saying or doing anything else. He's hooked! Ok - I have GOT TO finish MBS this weekend! Just recommended it to a mom while at work today (her 7 year old just read "The Diary of Anne Frank" !!!) and she was excited since she and her kids had been discussing mind control!! I love my job! I guess it's why we all love a good series...a chance to live in those stories a bit longer. So cool that you love your work. Not everyone says that! Oh, I wish it had been longer somehow! It's definitely complete as a story, but it was over too soon. I enjoyed finding out what the secret letters really were and seeing his grandmother become more human.